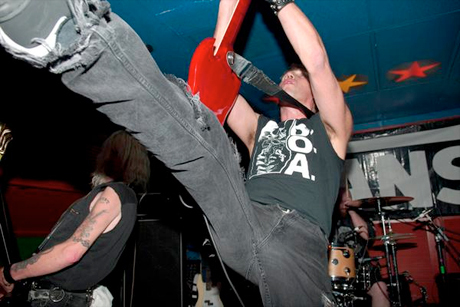 The 30th anniversary for Burnaby, BC legends DOA is edging closer and to celebrate it properly these oldcore punks are releasing a new album titled Northern Avenger. The band will start recording in mid-February, and for this massive occasion have acquired the services of famed mega producer Bob Rock (Metallica, the Tragically Hip, Bon Jovi). Released by the band's own label, Sudden Death, the album has a tentative release date in Canada for May and August in the rest of the world. In a press release Sudden Death described Northern Avenger as covering "a lot of fertile and explosive ground, as you would expect from a DOA album. Songs like 'Human Bomb,' 'Police Brutality' and 'Crossfire' are political and on fire. There's also the humour you would expect from DOA on 'Devils' Speedway' and 'Donnybrook.' All in all, it will be a blistering collection of songs."